Difference between revisions of "Creating a new Disease Model Plug-in"
* This page is out of date (but perhaps interesting as it shows how to create a plugin). * You no longer need to follow the steps on this page to create a new model. Please see instead the [[STEM Model Generator|NEW model generator]] Tool !! The page is perhaps interesting as it shows how one would (used to) create a plugin manually. * We have now made it easier to automatically generate a new disease or population model pluging. * See the [[STEM Model Generator]] page for the new easy to follow instructions. 1 See the NEW model generator Tool !! See the NEW model generator Tool !! You no longer need to follow the steps on this page to create a new model. Please see instead the NEW model generator Tool !! We have now made it easier to automatically generate a new disease or population model pluging. See the STEM Model Generator page for the new easy to follow instructions. See the STEM_Model_Generator/Install page for instruction on how to install the new model generator. You must first have your development environment set up and have the STEM sourcecode installed and running. Make sure you have the latest version of EMF installed. * This interface is an EMF Model. NOTE: The Java doc above the interface declaration is required. This is used by the Eclipse Modeling Framework to generate code for your model. Figure 3: After Creating the Interface your Workspace will appear as shown above. Click twice to see high resolution screenshot. Having now created the Interface, you will see errors (see the red indicators in figure 3) indicating that the class extended cannot be resolved. MANIFEST.MF file to open it. Below the edit window it will probably open, by default, in the OVERVIEW view. Click on the DEPENDENCIES tab. you will have to add several dependencies. This last dependency assumes you are extending a build in disease model (almost certainly the case). If you are extending your own existing extension, then you must also add that dependency. 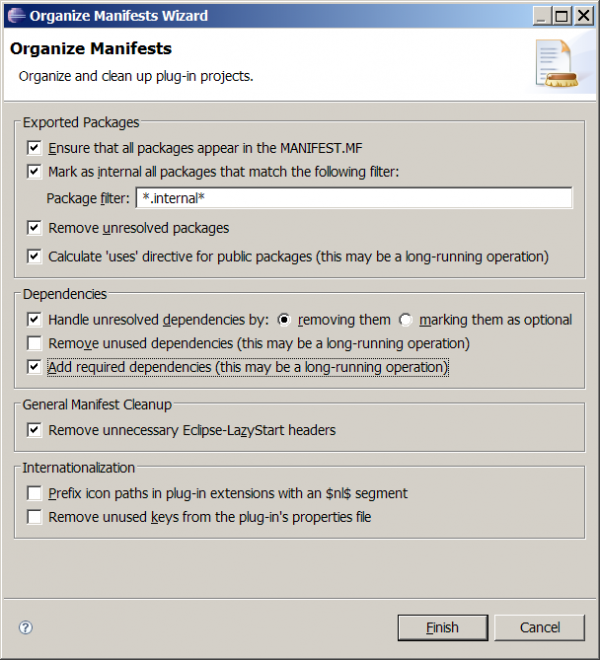 Figure 4: Required Dependencies in Manifest.mf Click twice to see high resolution screenshot. and select the model subfolder. Look at the package explorer. Figure 6: yourdiseasemodel.genmodel shown in the editor window. Click twice to see high resolution screenshot. You should now see a file plugin.xml below the 'model' folder in the package explorer for your new EMF project. note that they now provide the same information for your plugin. Figure 7: Having generated your model code the plugin.xml file should appear in the project explorer. The generated code is shown in the editor. Click twice to see high resolution screenshot. An implementation of the model object 'Your Disease Model'. 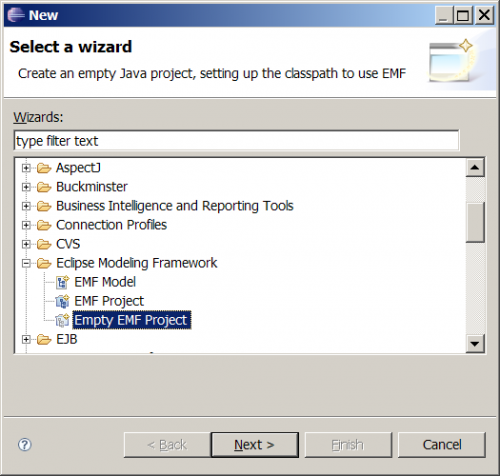 change the constructor definition to make it Public (by default EMF makes it Protected). Eventually, all of your model code will go in this implementation class by overriding superclass methods such as computeDiseaseDeltas() and/or computeDiseaseDeathDeltas(). This step ensures that the files we are about to autogenerate will go in the right place. >Window>show view>Other>General>Properties to open the properties view. The .genmodel tree will appear in the editor and the .genmodel properies will appear in the properties view. moving the .tests. from the end of the path to just after .stem. THE STEP BELOW WERE NOT NEEDED WHEN RECENTLY FOLLOWING THESE INSTRUCTIONS. THE ...EditPlugin CLASS COMPILED OKAY. KEEPING INSTRUCTIONS HERE JUST IN CASE. "cannot be resolved". Remove it. hit <ctrl S> to save. >source>add import to find the import. hit <ctrl S> to save. The file should now build without errors. The Preceding steps may not be needed - need to double check this. go to the Runtime tab. select all of the packages that appear and add them. On the Right hand side (see figure 8) click the Calculate Uses button. Figure 8: Configuring the RUNTIME tab in plugin.xml Click twice to see high resolution screenshot. Figure 9: When adding an extension, typing in the Extension Point Filter textbox will narrow the list of features you can select. expand it by clicking the (+). IMPORTANT: Be VERY careful to get the URI right here. Observe the three slashes (///). Eclipse uses the URI string in a map to retrieve adapter factories for different purposes, and a typo can be very tricky to debug later. 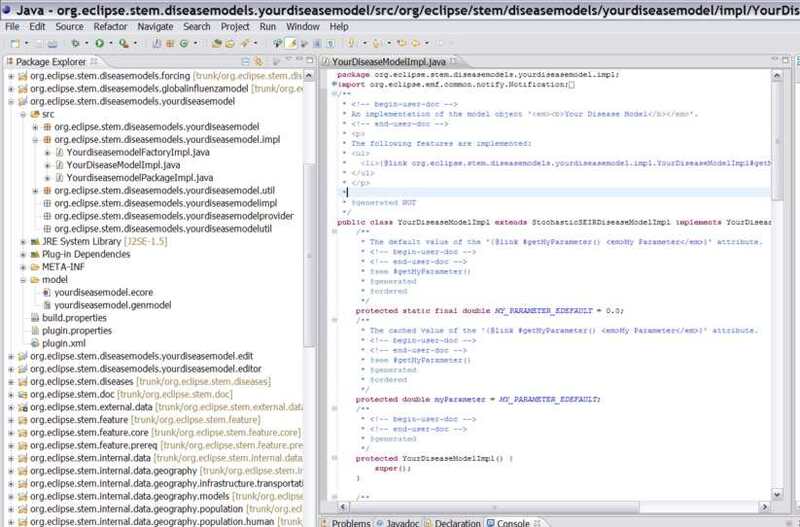 If you are unsure, look at the java class YourDiseaseModelPackage.java and the eNS_URI variable. THE generated_package EXTENSION WAS MISSING IN A RECENT ATTEMPT TO FOLLOW THESE INSTRUCTIONS. IF IT IS MISSING, MANUALLY ADD IT FOLLOWING THE STEPS ABOVE. This is done most easily by editing the xml itself. You should now see a total of three extensions listed. under Binary Build select icons by ckecking the check box. click the checkbox to: "Activate this plug-in when one of its classes is loaded"
With the single exception of the org.eclipse.core.runtime dependency, all of these should be Rexported. If they are not (as indicated by a small black arrow), click on each one in turn, click Properties, and then make sure that the checkbox "Re-export this dependency" is selected. make sure the bundle activator line has $Implementation at the end of it. click on "update classpath settings"
Organize the plug-in using "Organize the Manifest Wizard" and configure the wizard as shown in figure 10. Figure 10: Dialog settings to organize your Manifest.mf Click twice to see high resolution screenshot. To allow the user to enter values for your new parameter when your disease model is selected from the dropdown provided by the new disease wizard, there are a few steps you need to follow. 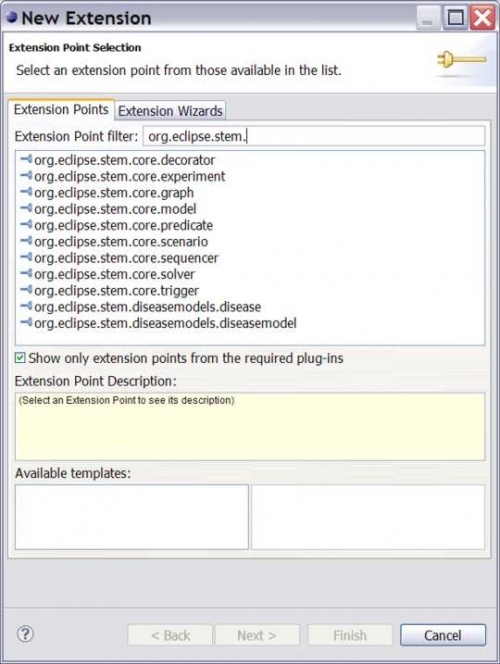 You can use the package that has already been pre-generated (org.eclipse.stem.ui.diseasemodels.yourdiseasemodel.presentation) or you can create a new (more descriptive) package. The class won't compile. 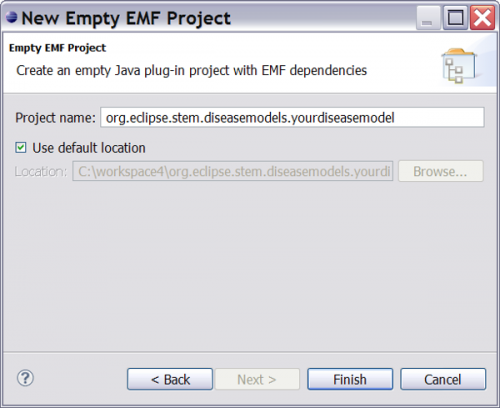 You need to add a dependency in the plugin.xml to the org.eclipse.stem.ui project. 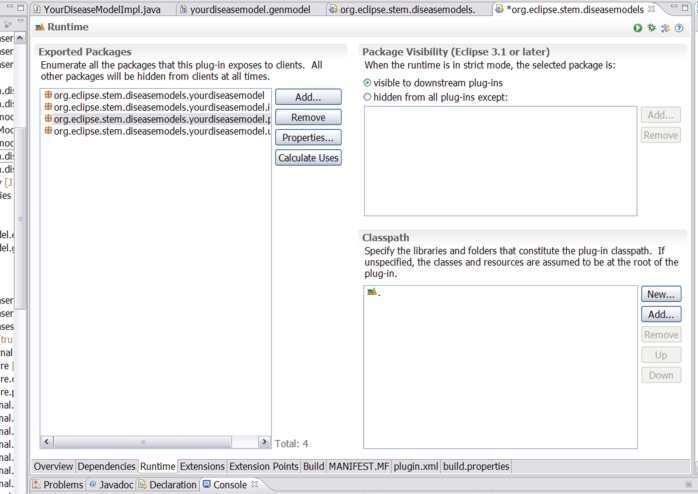 Open the plugin.xml and the Dependencies tab, click Add and select org.eclipse.stem.ui. 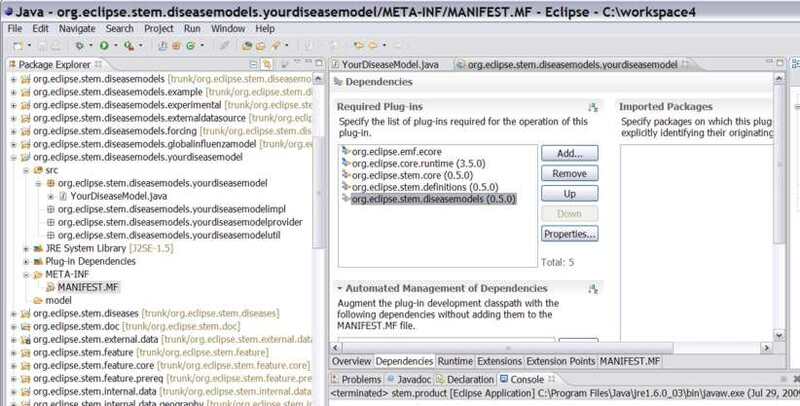 Also add org.eclipse.stem.ui.diseasemodels to the dependencies. Next, create an empty text file yourdiseasemessages.properties in the package (as pointed to by the BUNDLE_NAME). The files won't compile. 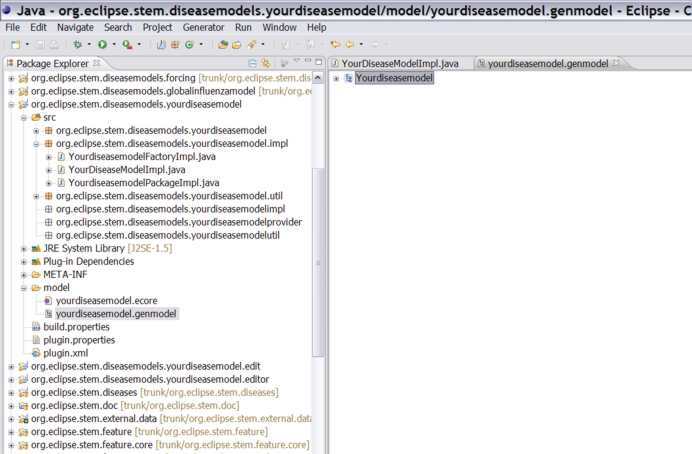 Start by editing YourDiseaseModelPropertyEditorAdapterFactory.java and change the superclass so that it is correct (YourDiseaseModelAdapter). Change the "createExampleDiseaseModelAdapter" method to "createYourDiseaseModelAdapter" and make sure it returns a new instance of YourDiseaseModelAdapter. Next, in "YourDiseaseModelPropertyEditorAdapter", make sure the method "createDiseaseModelPropertyEditor" returns a new instance of "YourDiseaseModelPropertyEditor"
This will reuse the superclass method for creating the actual widgets needed to enter parameter values for your disease model. In the populate() method (which is called when it is time to create a new instance of your disease model when the user has finished with the wizard), replace the case statements with the new parameter(s) that are unique for your disease model. In the validate() method, you add code to validate the values entered by the user for your new disease parameters. To make sure this method is invoked when the plugin is started, check the plugin.xml and the Overview tab. For activator, YourDiseaseModelEditorPlugin$Implementation should be specified. 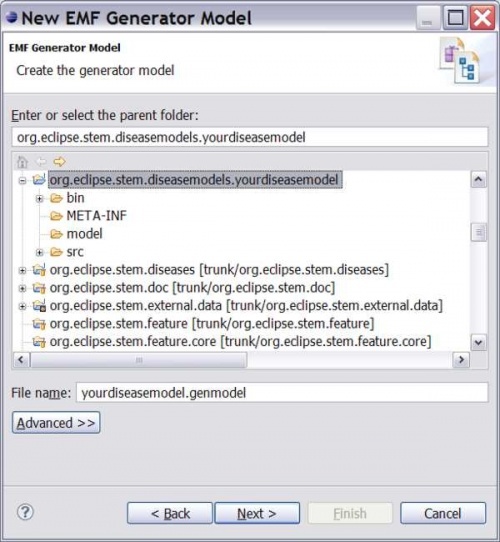 Make sure that the two plugins you just created are checked in the run configuration for STEM (org.eclipse.stem.diseasemodels.yourdiseasemodel and org.eclipse.stem.ui.diseasemodels.yourdiseasemodel) and you should be able to create and validate new instances of your disease model, and drag them into your custom models. This page was last modified 13:41, 6 February 2014 by James Kaufman. Based on work by James Kaufman and Judy Douglas, Eclipsepedia user Edlund.almaden.ibm.com and others.